Research being an investigative process is employed to increase or revise the current knowledge. Scientific research involves the conduct of a methodical study to prove a hypothesis or give an answer to a specific question with the main aim of finding definitive answer. This paper aims to advance knowledge of research and develop interest in the postgraduate students. It also throws light on the existing and emerging research strengths within a “high-performance culture.” The trends in dental research worldwide are looked at, in particular, a comparison between the publication status in two countries, namely India and Australia. The current themes in dental research are also discussed to facilitate future projects for the aspiring pediatric dentists. Stress is given to the importance of evidence-based dentistry as the current times call for high-quality and ethical papers which are devoid of plagiarism. The common reasons for failure of a research are explored and the strengthening factors are highlighted. Proper planning of a pertinent research project is beneficial to the researcher as well as the dental community. Background: Iron deficiency anemia accounts for 90% of all types of anemia in the world. Although the prevalence has declined in recent years, it remains an important pediatric public health problem. Iron deficiency has also been associated with dental caries. It impairs salivary gland function causing reduced salivary secretion and buffering capacity leading to increased caries activity. Aim: The aim of the study is to explore an association between dental caries and serum levels of iron and ferritin in children aged 3–12 years. Subjectsand Methods: The study group included 120 children, hospitalized for uncomplicated medical problems. Blood reports were evaluated to determine serum iron and ferritin levels. Dental caries experience was assessed using deft index. Statistical Analysis Used: The collected data were tabulated and analyzed using Student's t-test and Pearson's correlation coefficient. Results: Out of 120 children, 38 children showed low serum iron levels of which 31 children had dental caries and nine out of 15 children in the high serum iron level group showed dental caries. High ferritin levels were seen in three children among which two children were caries-free and only one child had a low ferritin level who also had a positive deft score. 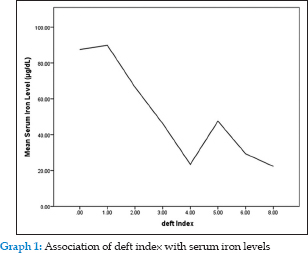 Conclusion: Based on the results, it was concluded that there is an inverse association between serum iron levels and dental caries whereas there is no association between serum ferritin levels and dental caries. Introduction: Certain factors in mothers could be risk indicators for certain diseases in their children. Hence, this study was undertaken to assess maternal risk indicators for the development of early childhood caries in their children. Methodology: A comparative, cross-sectional study was designed among 180 mother-child pairs attending various Anganwadi centers. Demographic, dietary, oral hygiene practices and other necessary information were collected from mothers using a structured questionnaire. Caries status and amount of plaque were recorded through clinical examination. Nonstimulated saliva from mothers was cultured for mutans streptococci (MS). Data were analyzed using SPSS version 17. Chi-square, Student's t-test, and logistic regression were used. A P ≤ 0.05 was considered statistically significant. Results: In the study group, 73.3% of mothers had caries as compared to only 53.3% mothers in control group. While mean DMFT and mean DMFS of mothers in the study group was 3.78 ± 3.91 and 8.37 ± 12.2, respectively, the same for the mothers in the control group was 2.66 ± 3.01 and 5.8 ± 5.3. Sixty (66.7%) out of ninety mothers in the study group had a high MS count as compared to only 40 (44.4%) mothers in control group (P = 0.003). Conclusion: The present study showed that high salivary MS count and decay in mothers could be important risk indicators for the development of caries in their children. Aims: To help dentists to communicate with the hearing impaired patients, reach an accurate diagnosis and explain the treatment plan by learning some signs and gestures used in the nonverbal communication (NVC) and by devising some new signs and gestures related to dentistry which shall be easy to learn and understand both by the hearing impaired patients and the dentists. Settings and Design: The study was carried out on 100 hearing impaired students in the age group of 10–14 years in two special schools for hearing impaired children located in two different states of India, where different spoken languages and different sign languages are used. One dentist (expert dentist) was trained in the NVC and the other dentist (non expert dentist) had no knowledge of this type of communication, communicated the same sets of statements related to dentistry, to the hearing impaired children. One1 translator was assigned to judge their interactions. Students were asked to tell the interpreter at the end of each signed interaction what they understood from the statement conveyed to them by both the dentists. Statistical Analysis Used: All data collected were subjected to statistical analysis using Chi-square test and odds ratio test. Results: In the special school of 1st state, the nonexpert dentist conveyed only 36.3% of the information correctly to the students, whereas the expert dentist conveyed 83% of the information correctly. In the special school of 2nd state, the nonexpert dentist conveyed only 37.5% of the information correctly to the students, whereas the expert dentist conveyed 80.3% of the information correctly. Conclusions: Dentists should be made aware of the NVC and signs and gestures related to dentistry should be taught to the hearing impaired students as well as the dental students. Purpose: This study was conducted to examine the contribution of inadequate sleep and its associated factors, on behavior and cooperation of children in the dental operatory. 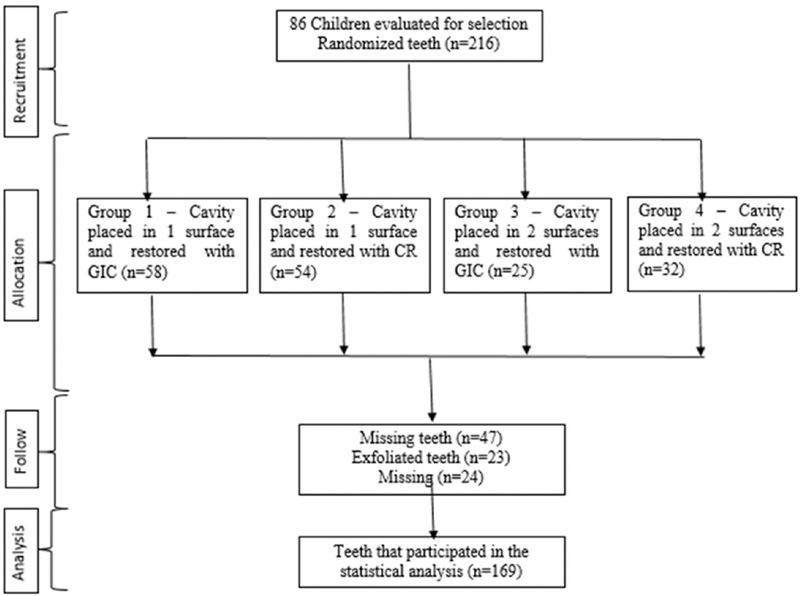 Materials and Methods: A cross-sectional study was conducted on 100 healthy children at the time of their initial visit to the dental hospital, ranging from preschoolers to adolescents. Data acquisition was done by a questionnaire. Interview with the accompanying person was done to ask about the sleep duration, naps, and sleep habits of the child. Children's behavior during their preliminary examination was studied and categorized according to Frankl's behavior rating scale. Data were analyzed by linear regression analysis and Spearman's correlation with the aid of SPSS 16.0 software. Results: Total duration of sleep accounted for a small but significant contribution in behavioral problems of children. Significant correlation was found between duration of sleep and cooperative behavior in dental operatory (R = 0.478). However, the duration of sleep was negatively correlated to the number of siblings and socioeconomic status of the family. Conclusion: Children who had shorter total sleep duration had increased behavioral problems in dental operatory. Introduction: There is a great need for identifying fearful children, who often present problems in patient management, thus affecting the quality of dental care rendered to them. This study is unique in the way that dental fear was assessed through three fear scales as research has suggested the use of more than one scale because each scale has its own restrictions and is open to criticism. Aim: The aim of this study was to evaluate dental fear and anxiety (DFA) among children aged 3–14 years using three fear measurement scales. 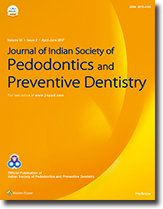 Methods: The study was conducted on children (3–14 years) who visited the Department of Pedodontics and Preventive Dentistry at Maulana Azad Institute of Dental Sciences, New Delhi. The DFA levels were measured using three fear measurement scales, i.e., facial image scale (FIS), dental fear scale (DFS), and children's fear survey schedule-dental subscale (CFSS-DS). The dental behavior was estimated using the Frankl's behavior rating scale (FBRS). Results: The prevalence of dental fear according to FIS was 14.3%, according to DFS was 22.6%, and according to CFSS-DS was 7.4%. In assessment of the behavior of children in the clinics through FBRS, it was observed that he maximum number of respondents (69.8%) showed Frankl's Rating 3 i.e. positive. In the DFS and CFSS-DS, the factor which caused most fear was “feeling the needle injected” and “injections,” respectively. Conclusion: Assessment of dental fear is an extremely useful tool for the dental practitioner, who can use it to customize the behavioral treatment and management for child patients. Context: Family structures can affect the oral health of the child. However, little is known about the impact of the family structure on oral health of children in Africa. Aims: To determine the association between family structure, twice daily toothbrushing, use of fluoridated toothpaste, caries, and oral hygiene status of 5–12-year-old children resident in semi-urban Nigeria. Settings and Design: Secondary analysis of the data of 601 children recruited through a household survey conducted in Ile-Ife, Nigeria. Subjects and Methods: The association between dependent variables (presence of caries, good oral hygiene, use of fluoridated toothpaste, and twice daily toothbrushing) and the family structure (parental structure, number of siblings, and birth rank) was determined. Statistical Analysis Used: Simple and multivariate regression analysis was used to determine the association. The regression models were adjusted for age and gender. Results: Children who were not primogenitor had significantly reduced odds of using fluoridated toothpaste (AOR: 0.91; 95% confidence interval [CI]: 0.85–0.97; P = 0.01) when compared with children who were primogenitors or only children. Furthermore, having 0–2 siblings significantly reduced the odds of having caries (AOR: 0.46; CI: 0.28–0.78; P < 0.001) when compared with children who had three or more siblings. Children who used fluoridated toothpaste had significantly increased odds of having good oral hygiene (AOR: 1.64; 95% CI: 1.18–2.28; P < 0.001). Conclusions: For this study population, the number of siblings and the birth rank increased the chances of having caries and use of fluoridated toothpaste, respectively. Background: Dental fear is a common, essential, and inevitable emotion that appears as a response to the stressful situation, which raises children's anxiety level, resulting in reduced demand for pediatric dental care. Aims: (1) To compare and evaluate the effectiveness of customized tell-play-do (TPD) technique with live modeling for behavior management of children. (2) To compare the behavioral modification techniques in managing the children during their dental visits. Materials and Methods: Ninety-eight children aged 5–7 years were enrolled in the study and randomly allocated into two groups. Phase I: first visit. Group I - children were conditioned to receive various dental procedures using live modeling followed by oral prophylaxis. Group II - TPD technique was introduced with customized playing dental objects followed by oral prophylaxis. Phase II: second visit. After 7 days interval, all the study subjects were subjected to rotary restorative treatment. Evaluation: Heart rate, Facial Image Scale (FIS), and Venham-6-point index were used before intervention, after intervention, and during dental procedure to quantify the anxious behavior. Results: All 98 children after intervention underwent oral prophylaxis on first visit and rotary restorative treatment on second visit. The average pulse rate, FIS, and Venham scale scores were significantly lower among children who received TPD intervention when compared to those who received live modeling intervention. Unpaired t-test at 5% level of significance was considered as statistical significance. Conclusions: TPD is effective in reducing children's fear and anxiety about dental treatment, children enjoy playing with customized dental object. Thus, to promote adaptive behavior, TPD could be an alternate behavioral modification technique during pediatric dentistry. Background: Compounds present in green tea have been shown to inhibit the growth and activity of bacteria associated with oral infections. The purpose of this study was to compare the efficacy of chlorhexidine (0.12%) mouth rinse and combination (chlorhexidine and sodium fluoride) mouth rinse to that of green tea extract (0.5%) mouth rinse in reducing the salivary count of Streptococcus mutans and Lactobacillus in children. Materials and Methods: The sample for the study consisted of 75 school children aged 8–12 years with four or more (decay component) of decayed, missing, and filled teeth index. Children were divided randomly into three equal groups and were asked to rinse with the prescribed mouth rinse once daily for 2 weeks after breakfast under supervision. Nonstimulated whole salivary sample (2 ml) was collected at baseline and postrinsing and tested for the colony forming units of S. mutans and Lactobacillus. Results: The results of the study indicate that there was a statistically significant reduction in S. mutans and lactobacilli count in all the three study groups. The statistically significant reduction in the mean S. mutans and lactobacilli counts were more in 0.12% chlorhexidine group than in the combination mouth rinse and 0.5% green tea mouth rinse group. There was no statistically significant difference in the reduction of S. mutans and lactobacilli count between combination mouth rinse group and 0.5% green tea mouth rinse group. Conclusion: Green tea mouth rinse can be a promising preventive therapy worldwide for the prevention of dental caries. Background: Conscious sedation is used in the pediatric dentistry to reduce fear and anxiety in children and promote favorable treatment outcomes. To achieve them, the primary clinical need is for a well-tolerated, effective, and expedient analgesic and sedative agent that is safe to use. Aim: The aim of the present study was to evaluate the efficacy of nitrous oxide-oxygen and triclofos sodium as conscious sedative agents in 5–10-year-old children. 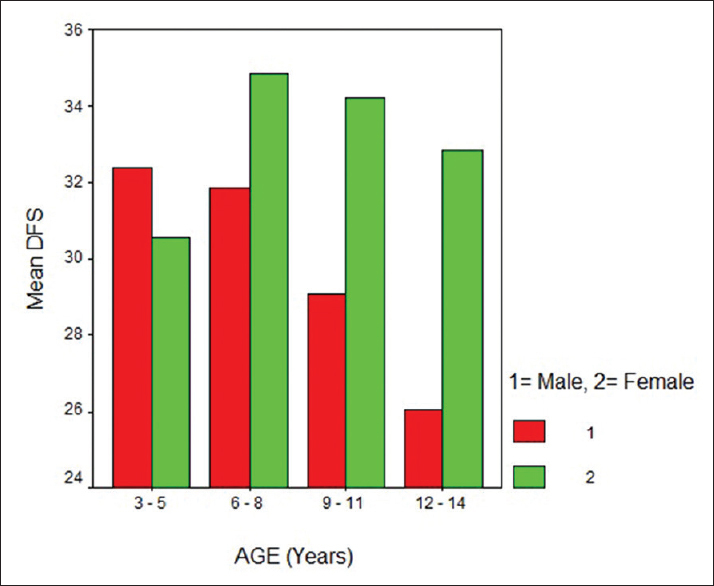 Methodology: Sixty children aged 5–10 years showing anxious, uncooperative, and apprehensive behavior were randomly divided and assigned into two groups (Groups A and B) such that Group A received 40% nitrous oxide-60% oxygen and Group B received triclofos sodium in the dose of 70 mg/kg body weight, given 30 min before the treatment procedure. During the whole course of sedation procedure, the response of the child was assessed using Houpt's behavior rating scale. The acceptance of route of drug administration by the patient and parent was also assessed. Data obtained were statistically evaluated using the Mann–Whitney U-test and Chi-square test. Results: Children sedated with triclofos sodium were significantly more drowsy and disoriented compared to those sedated with nitrous oxide. The overall behavior of children in both the groups was similar. Good parental acceptance was observed for both the routes of administration. 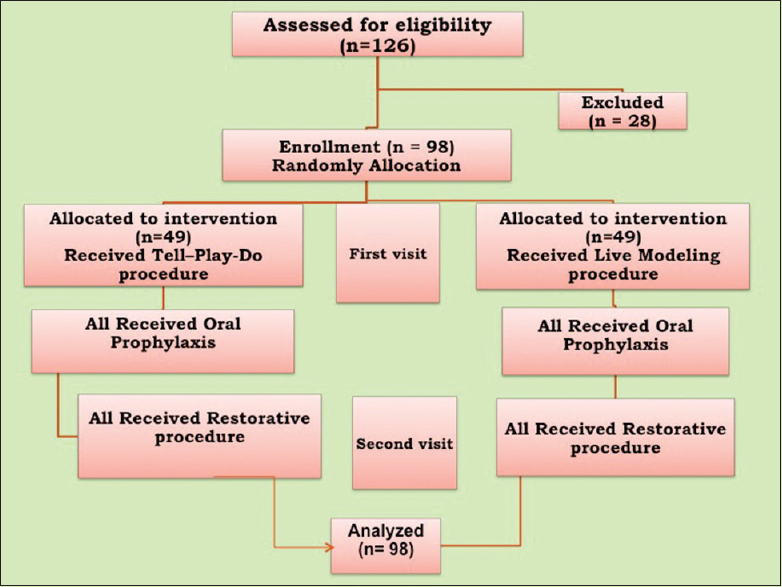 Patients accepted the oral route significantly better than inhalation route. Conclusion: Both nitrous oxide-oxygen and triclofos sodium were observed to be effective sedative agents, for successful and safe use in 5–10-year-old dental patients. Patients showed a good acceptance of the oral route compared to the inhalation route for sedation. Aim: Dental caries is a multifactorial disease which has a deleterious effect on the oral cavity. Improper oral hygiene habits are a cause for the same. The aim of this study was to compare the antibacterial efficacy of Munident, an Ayurvedic (herbal) dentifrice with commercially available toothpaste. Materials and Methods: A total of forty subjects between the age group 9 and 12 years, resident of Bala Yeshu Nilaya Bhavan, Mangalore, Karnataka, India, were chosen for our study. They were divided into two groups containing twenty subjects in each; Group 1 for standard toothpaste and Group 2 for Munident. The decayed, missing, and filled teeth scores were noted from each subject. Group 1 was instructed to brush the teeth using commercially available toothpaste and Group 2 was instructed to brush using commercially available Munident (herbal) dentifrice. Both the groups brushed the teeth using soft variety of tooth brush. 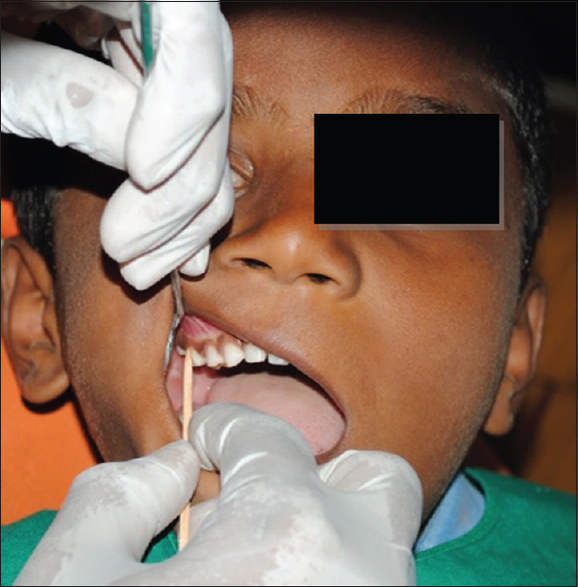 The gingival bleeding index and salivary Streptococcus mutans count were noted pre- and post-brushimg for both groups. The results obtained were subjected to statistical analysis. Results: Munident (herbal) dentifrice showed better efficacy in comparison to toothpaste in terms of gingival bleeding index and salivary S. mutans count. Conclusion: Munident (herbal) dentifrice has better gingival bleeding index compared to standard formulation of toothpaste. Hence, the practice of using herbal dentifrice should be encouraged. Background: Minimal invasive approaches to managing caries, such as partial caries removal techniques and atraumatic restorative treatment (ART), are showing increasing evidence of improved outcomes over the conventional complete caries removal. Objective: To evaluate clinically and radiographically the effect of ART on restorations using restorative cement and glass ionomer cement (GIC) for dental caries in the deciduous molars of children aged between 4 and 8 years. Settings and Design: The study design was a split-mouth, randomized, blind clinical trial. Materials and Methods: Eighty-six patients had 108 restorations placed with GIC (Ketac Molar Easy Mix – 3M ESPE) and 108 restorations placed with composite resin (CR) (Filtek Z250 – 3M ESPE). The restorations were assessed by means of images obtained with a digital camera and periapical radiographs at baseline and after 12 months of follow-up. Statistical Analysis: The Student's t-test, Pearson Chi-squared test, and Bonferroni paired comparison test were used to evaluate the differences in proportions and correlations between the variables. Results: After 12 months of follow-up, the restorations were considered clinically successful in 89.3% of cases and radiographically successful in 80.5% of cases. There was statistical difference neither between the two restorative materials used nor between the numbers of restored surfaces. Conclusions: GIC and CR can be used successfully for restorations of one or two dental surfaces after ART. Background: There is a need for exploration of the role of chemotherapeutic agents and its role in the prevention of early childhood caries (ECC) and its recurrence. Aim: The aim of this study was two-fold: (1) To compare the antimicrobial efficacy of three commonly used chemotherapeutic agents in the prevention of ECC in comparison with a control and (2) To ascertain the role of chemotherapeutic agents in the prevention of ECC. Materials and Methods: Sixty children with ECC in the age group 3–6 years were randomly allocated into four groups. To each group of children after full oral rehabilitation either 10% povidone-iodine (PI), or chlorhexidine (CHX) varnish (Cervitec Plus), or fluoride varnish (Fluor Protector) were applied twice at an interval of 1 week, Group 4 served as control. 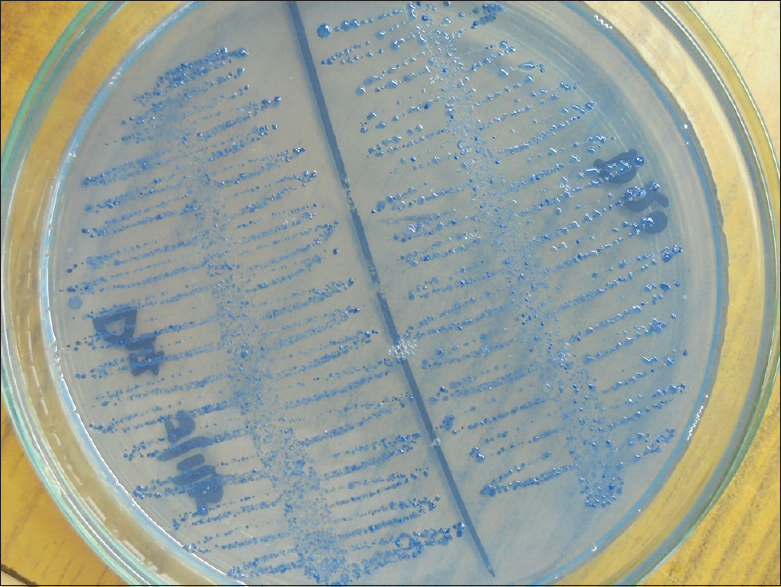 Streptococcus mutans count in saliva and plaque were collected at baseline, 30, 60, and 90 days and the presence of S. mutans was evaluated using the Dentocult SM strip mutans kit. The efficacy of 10% PI, CHX varnish (Cervitec Plus), and fluoride varnish (Fluor Protector) was compared with the control group at 30, 60, and 90 days. An intergroup comparison was also done during the same time intervals. Results: The reduction of S. mutans count in the plaque and saliva was greatest in the fluoride varnish treated groups at all time intervals (30, 60, and 90 days). Fluoride varnish, CHX varnish, and 10% PI showed significant improved efficacy when compared to the control group (P < 0.001). Fluoride varnish showed significantly lower counts of S. mutans compared to CHX varnish at all time intervals (30, 60, and 90 days) and also significantly lower counts compared to 10% PI at 60 and 90 days interval (P < 0.001). A 2-year-old male child who was running and fell with a toothbrush in his mouth suffered an injury to the inside of his right cheeks. His mother noticed that the toothbrush had impaled his mouth, and removed it. On arrival, a wound was observed on the right cheeks and palate. His general condition was good. However, computed tomography revealed emphysema from the left side of epipharynx to the upper mediastinum. This patient shows the importance of not only checking the medical history and performing a physical examination but also performing an imaging examination.